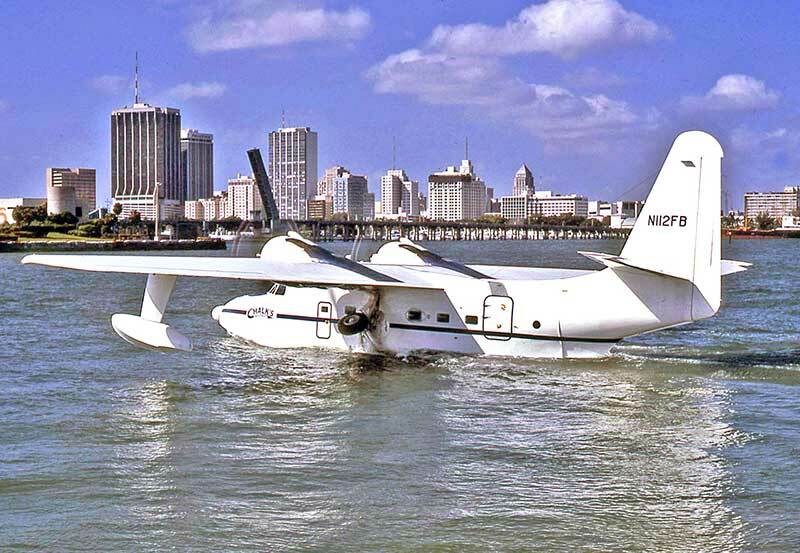 down by the FAA due to operational safety infringements. 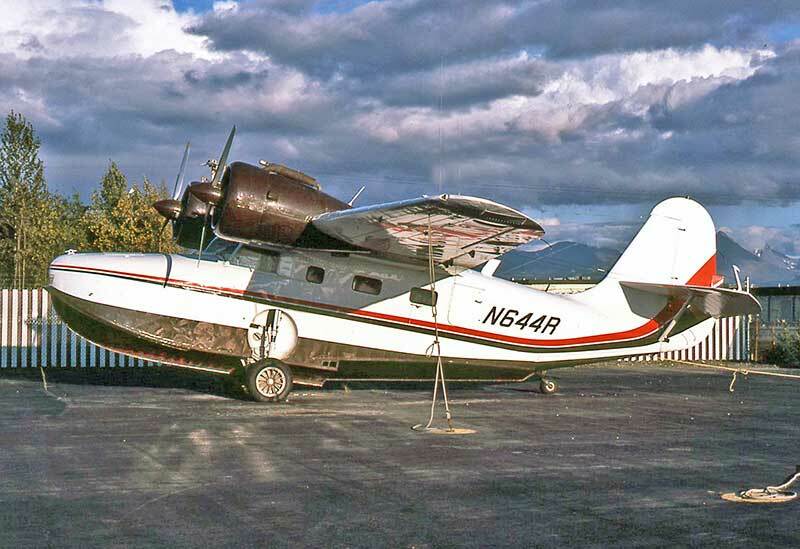 The AAB Gooses and Mallards were retired pending resale. 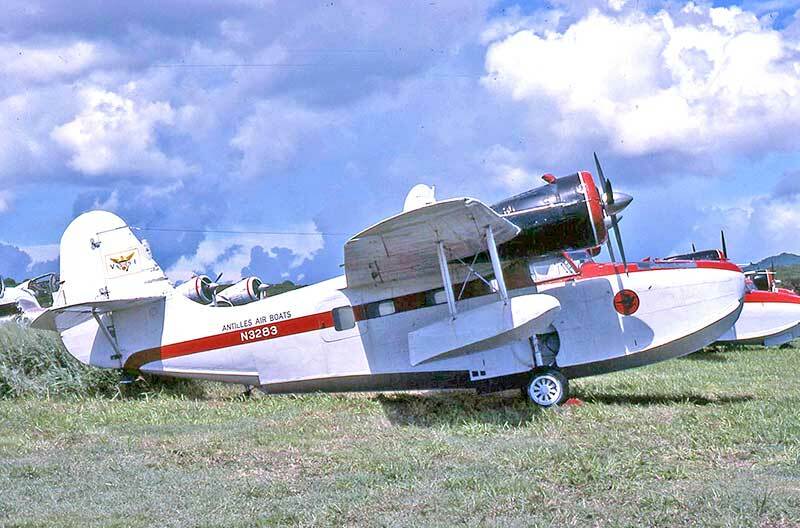 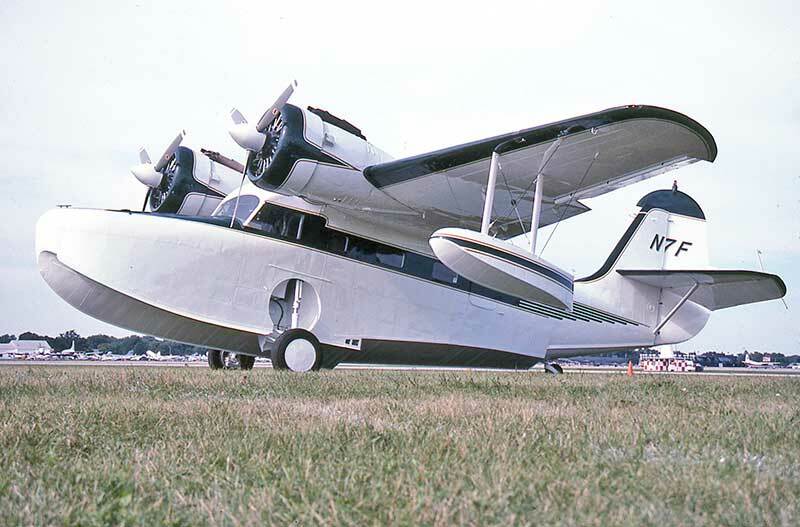 This particular Goose was a wartime US Navy JRF-5 which later saw lengthy military use in Argentina and later Paraguay. 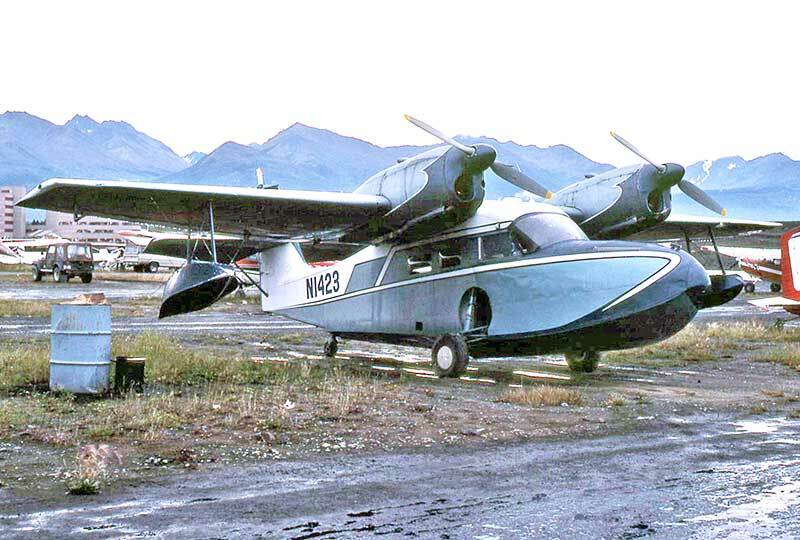 since the early 1950s operated by the US Department of Interior. 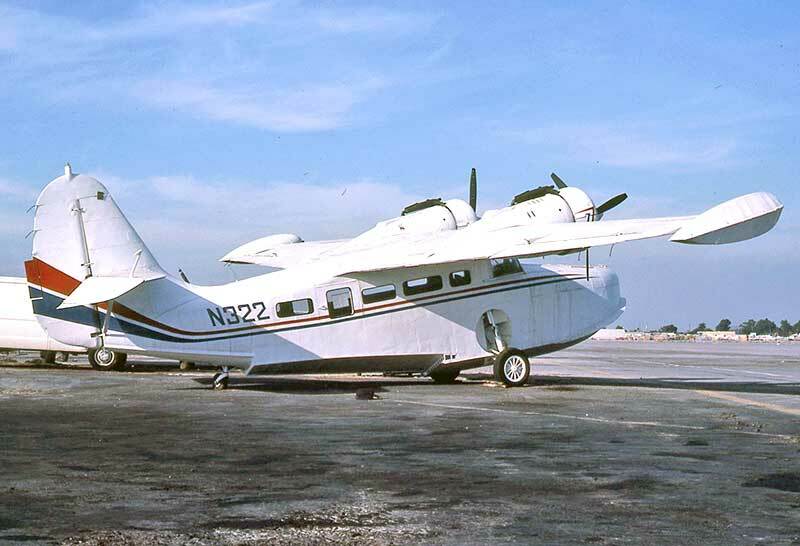 use on airline services to Catalina Island. 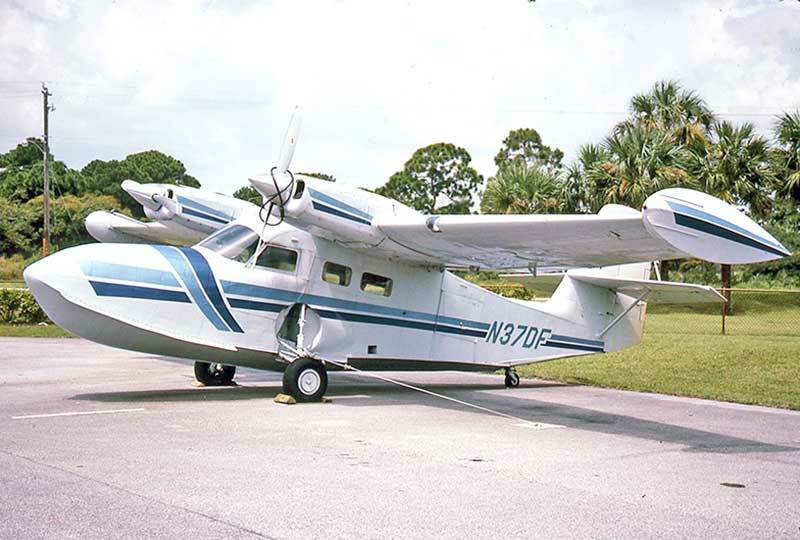 Modifications include lengthened windows and retractable wing tip floats. 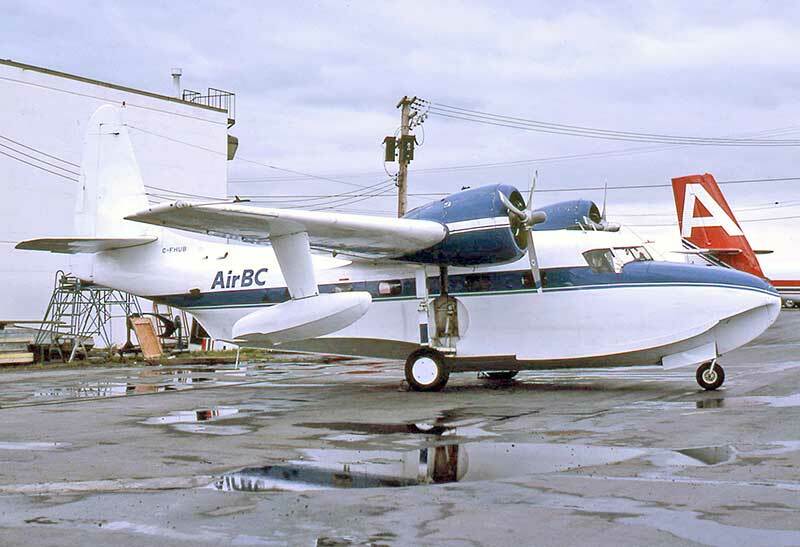 McKinnon G-21C Turbo Goose C-FAWH powered by PT-6A turbines seen at Vancouver BC in September 1981. 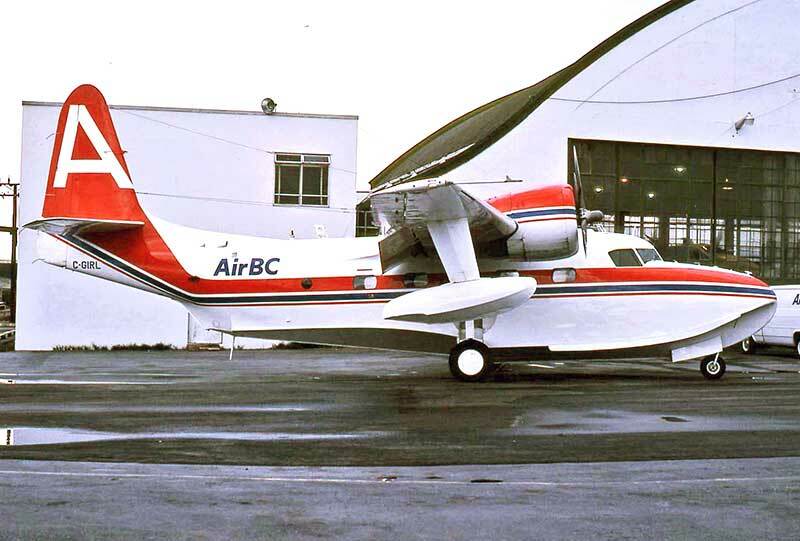 It was operated by Air BC on scheduled services to coastal communities along the British Columbia coastline. 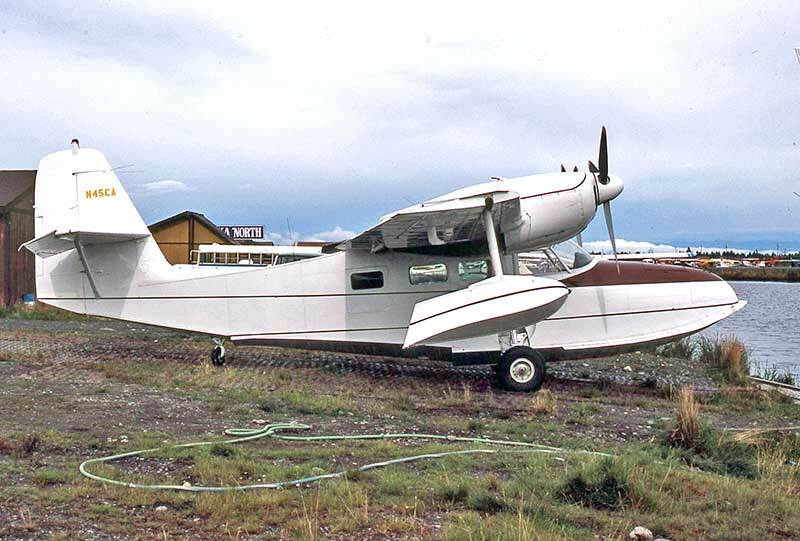 Alaska in September 1981 retains the original 200hp Fairchild Ranger engines. 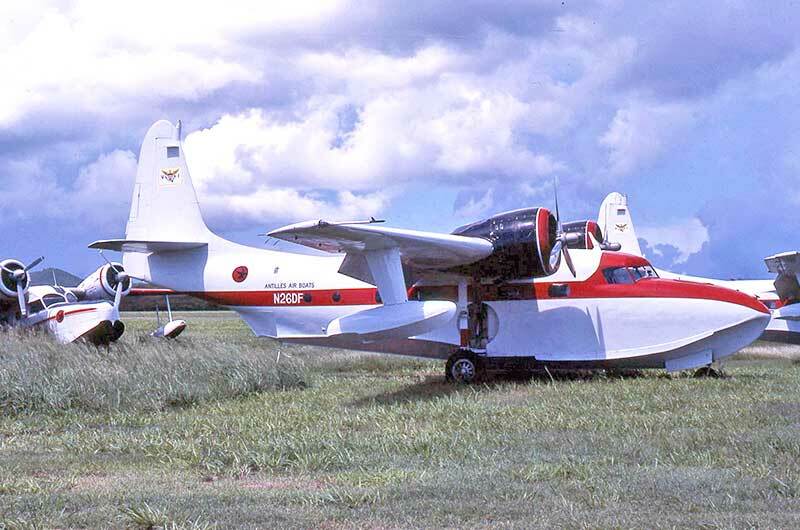 It was owned by bush operator Red Dodge. 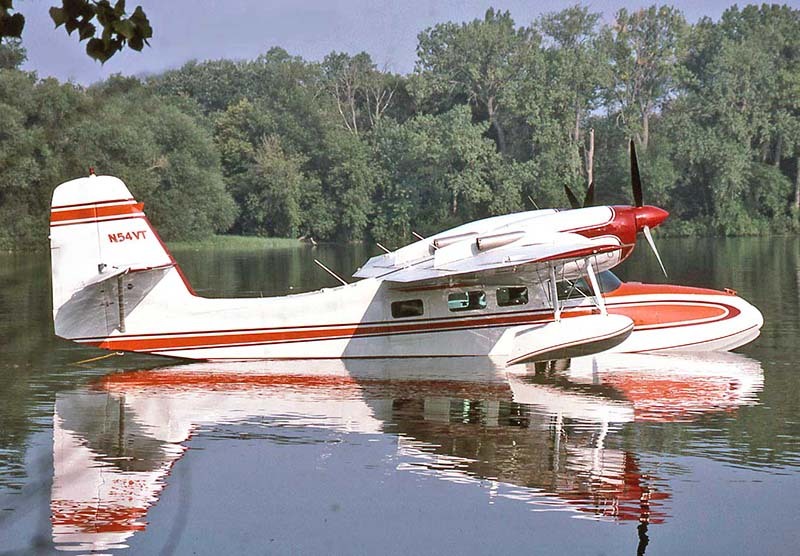 Super Widgeon modification kits marketed using a variety of power plants and airframe improvements. 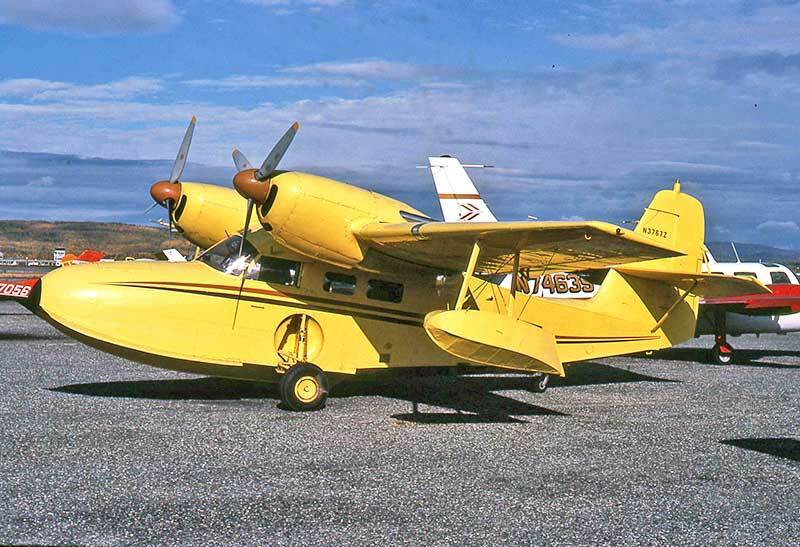 featured 310hp Lycoming GO-480s with three bladed props and retractable wing tip floats. 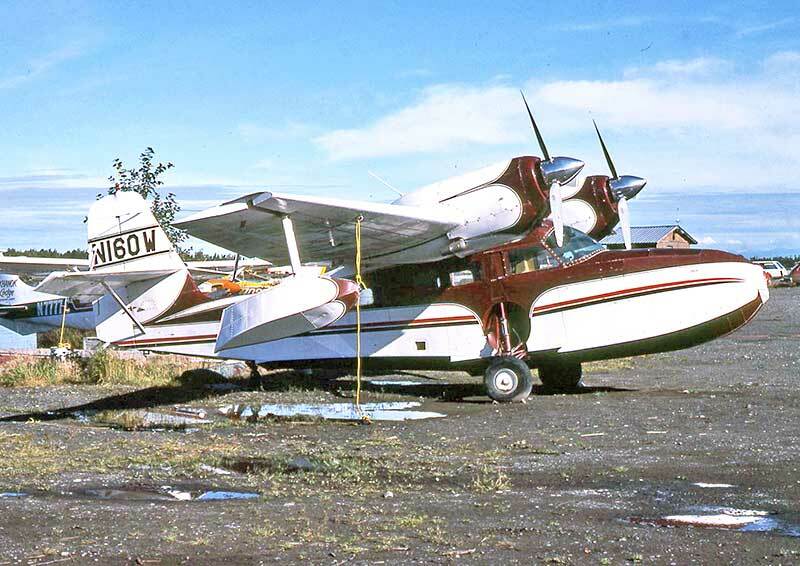 included Lycoming GO-480s with 3 bladed props, hull and airframe modifications including retractable wing tip floats. 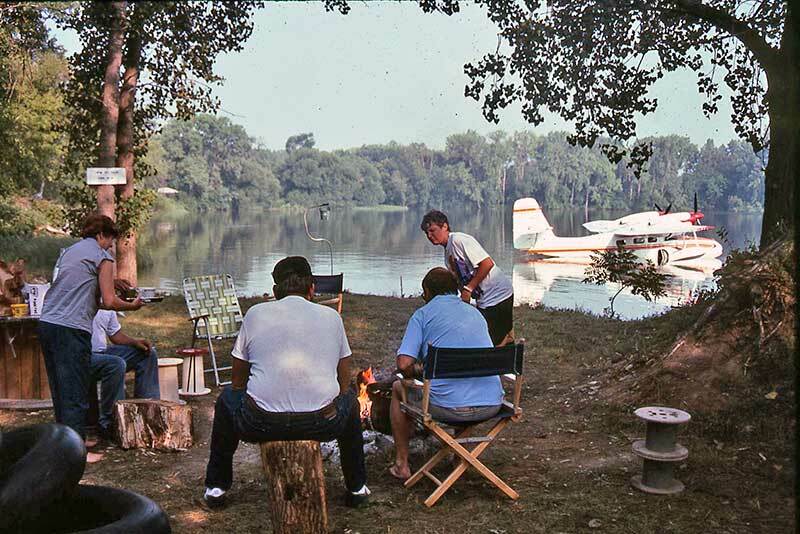 Idyllic scene at Round Lake Wisconsin July 1989 as campers prepare breakfast with their Widgeon N54VT moored behind. 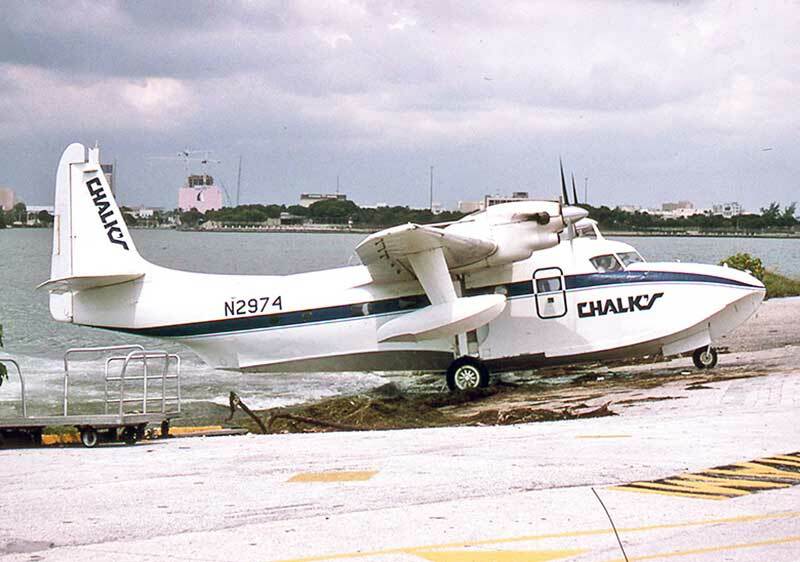 water at Miami harbor, Florida in October 1981 while operated by Chalk's International Airline. 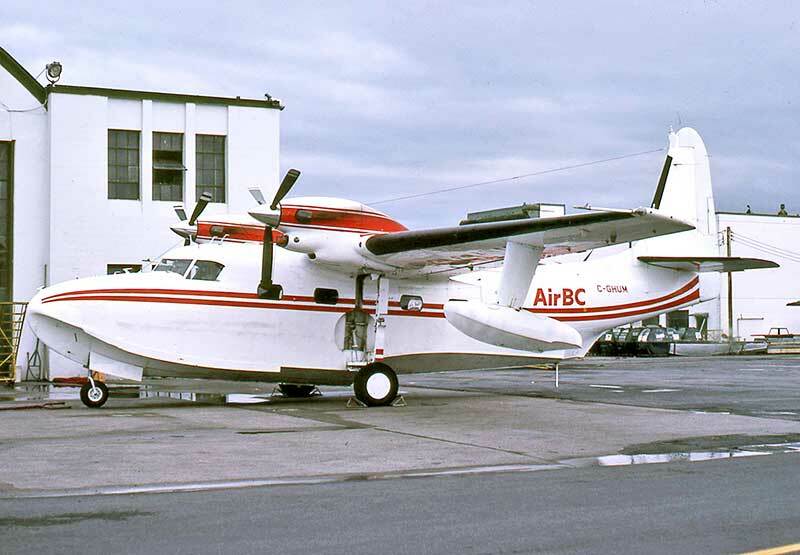 Vancouver BC was home base for Air BC which flew passenger services to BC coastal towns all the way to Alaska. 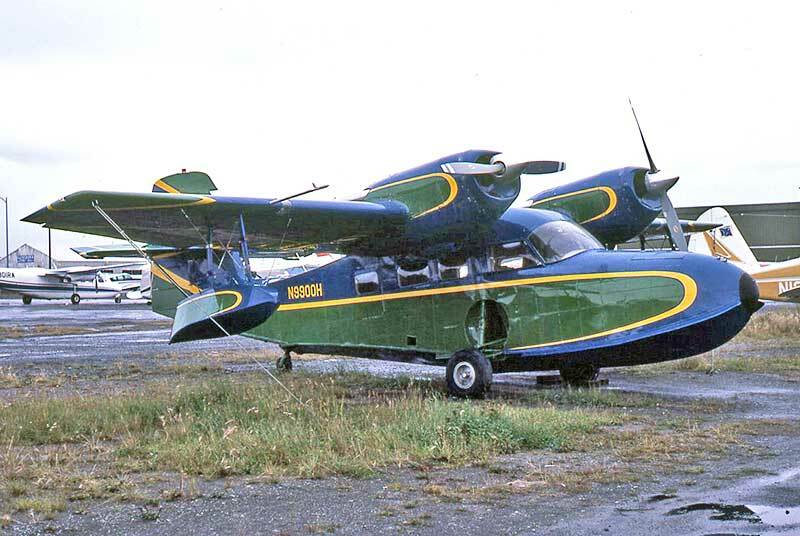 Mallard C-GIRL seen at Vancouver in September 1981. 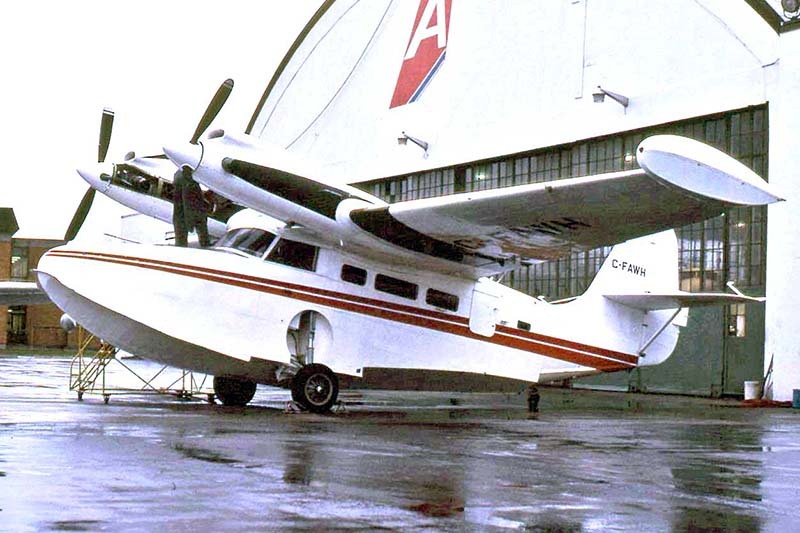 C-GHUM at Vancouver September 1981 was a Frakes Aviation G-73T Turbo Mallard conversion with PT-6A-34 turbines. 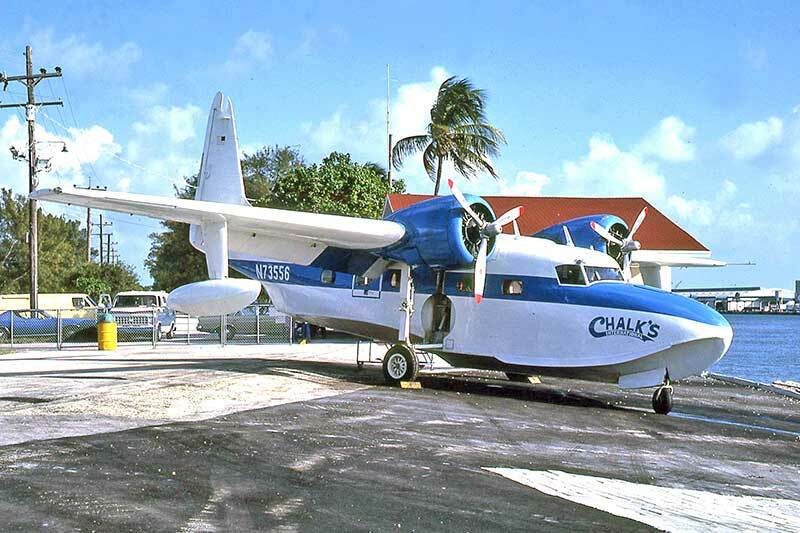 Chalk's International Airline at Miami had several Frakes Turbo Mallards. 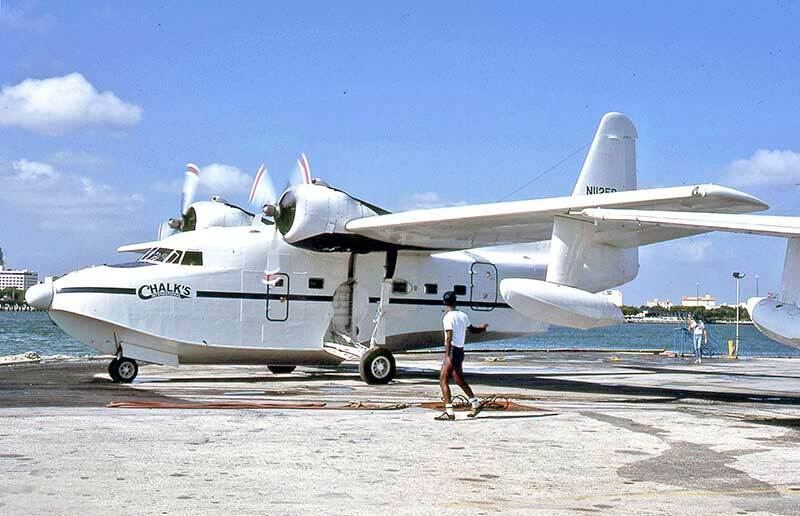 N2969 in October 1981. 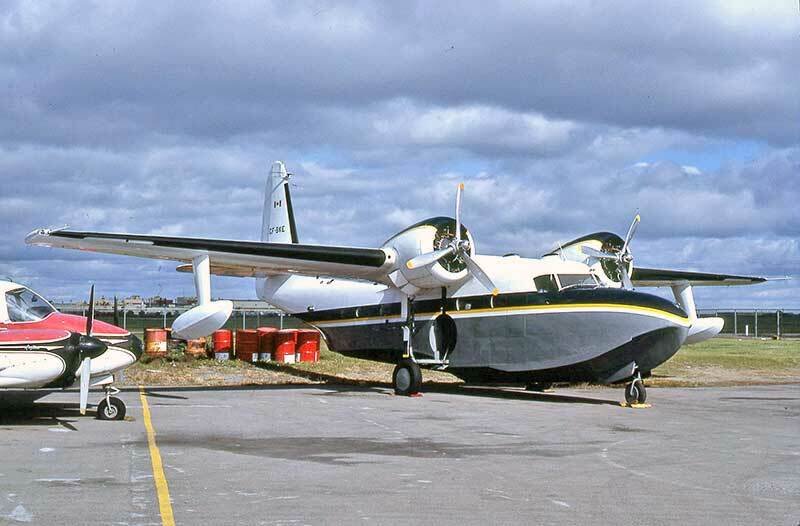 Many military-surplus Grumman HU-16 Albatross amphibians came on to the US civil market. 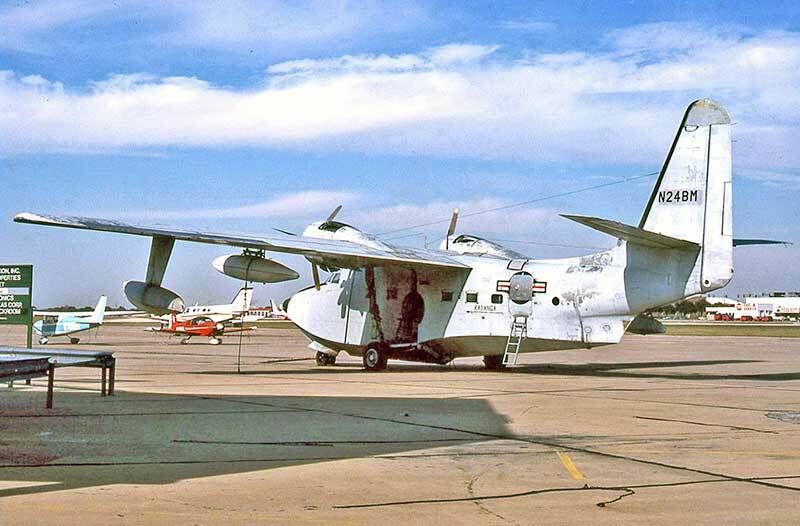 N24BM at Dallas-Love Field, Texas in November 1981was a former USAF HU-16B model in faded original paintwork. 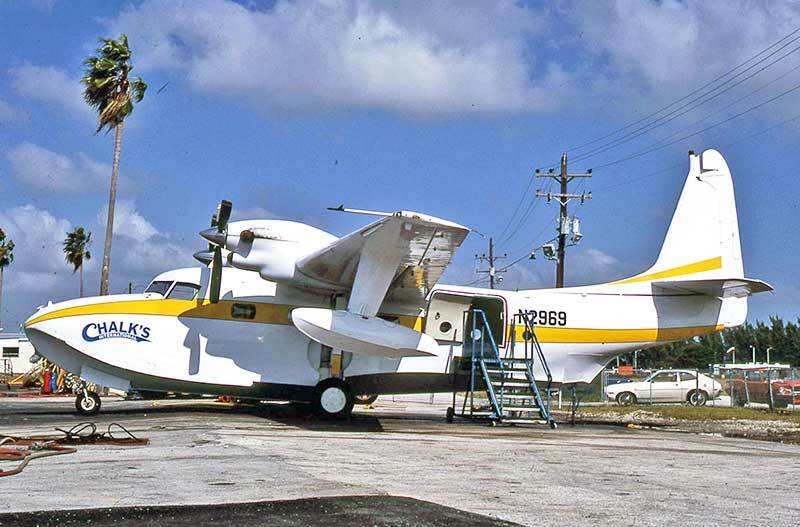 Typical US Navy surplus HU-16E N7026H parked at Opa Locka, Florida in August 1989 waiting for civil conversion. 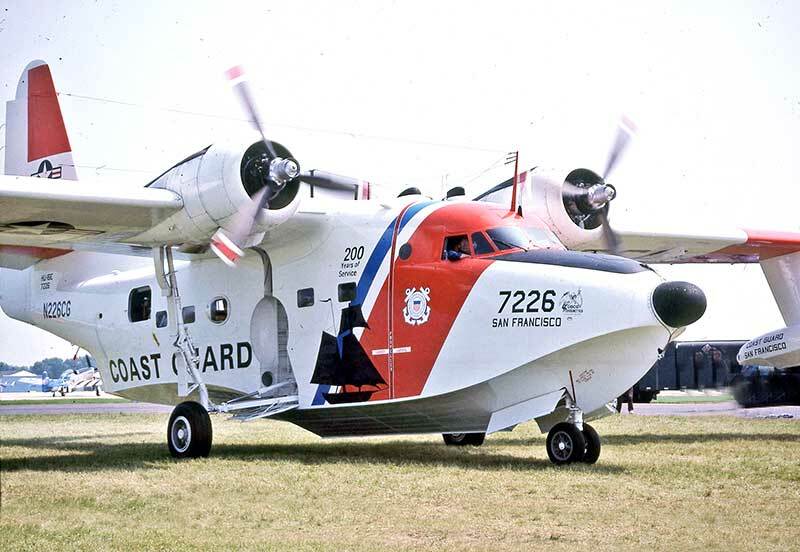 Military markings are sprayed over but the Navy serial number Bu142360 has been helpfully hand-painted on the fuselage. 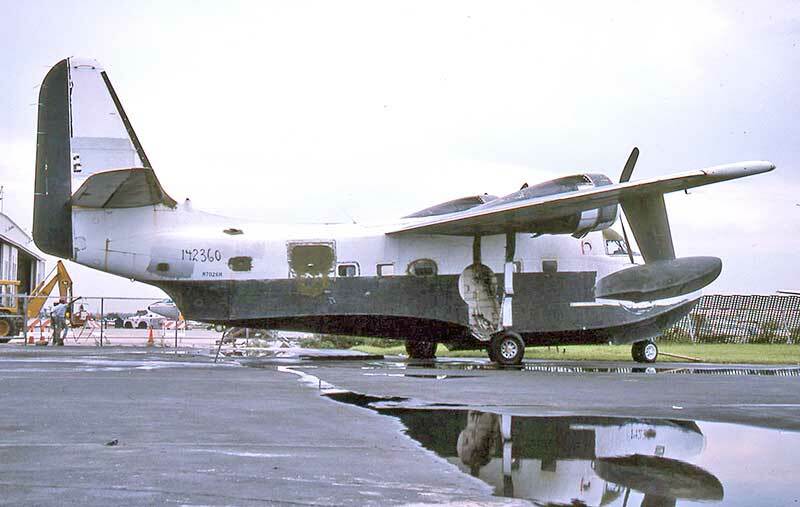 And this is how they look after civil overhaul, often with sumptuous "air yacht" cabins. 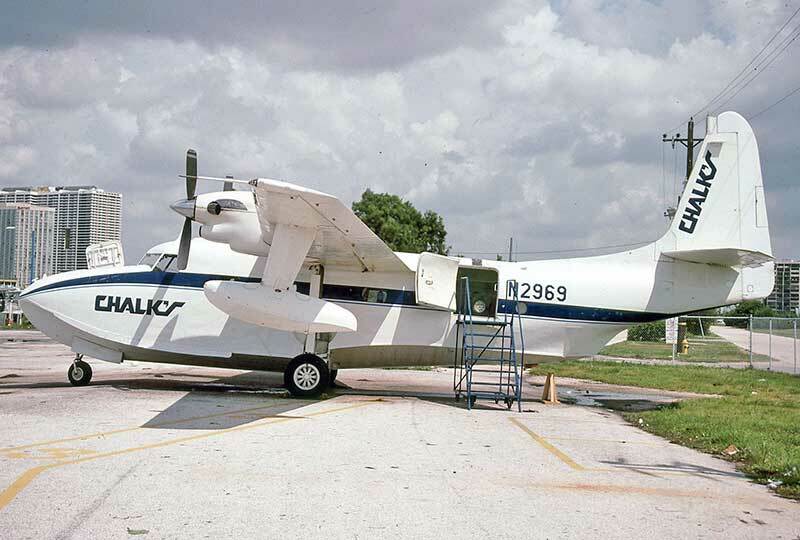 N8523H at Opa Locka August 1989.
seating for up to 28 passengers. 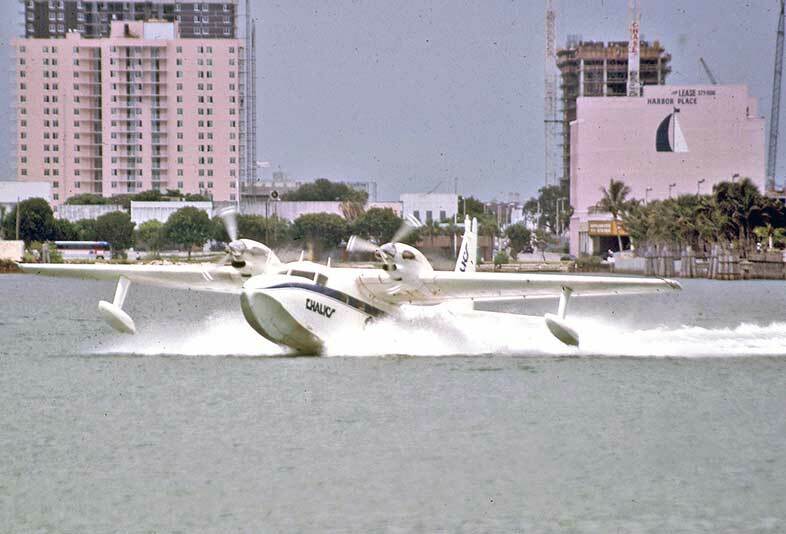 Here's one of their first N112FB in service at Miami harbor in October 1981. 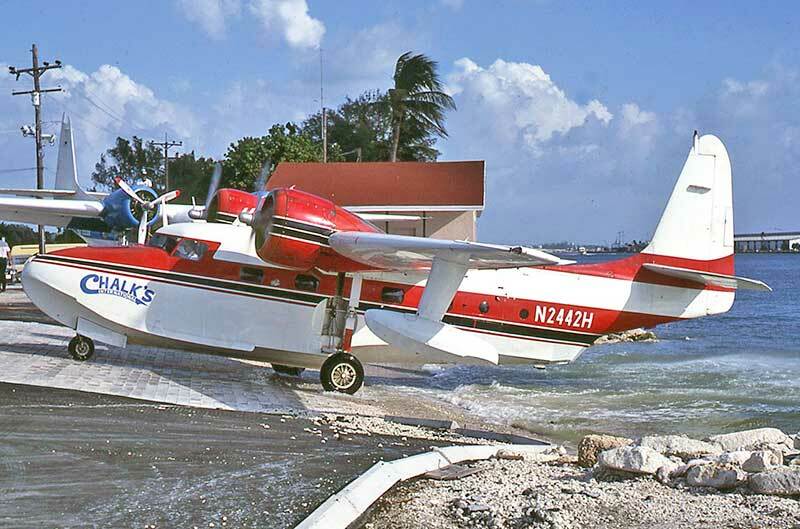 N112FB's undercarriage is still retracting as it leaves the ramp for a scheduled service to Bimini, Bahamas October 1981. 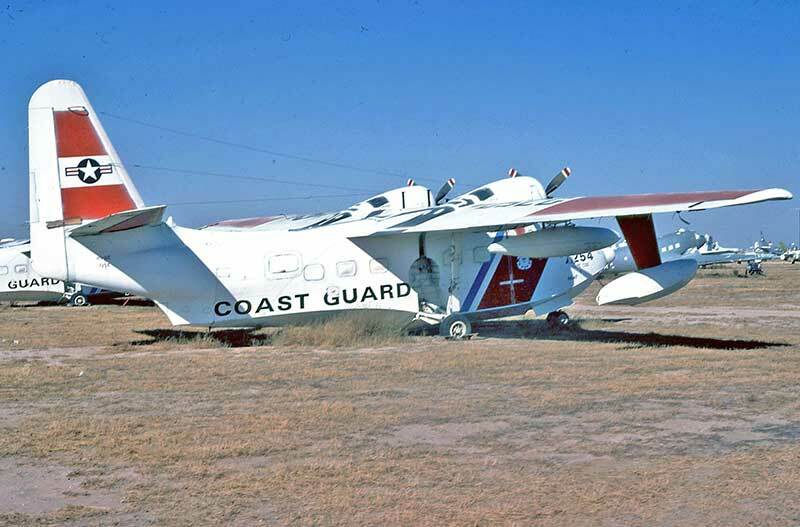 By November 1981 only a row of US Coast Guard HU-16Es remained at Davis Monthan AFB Arizona waiting for disposal. 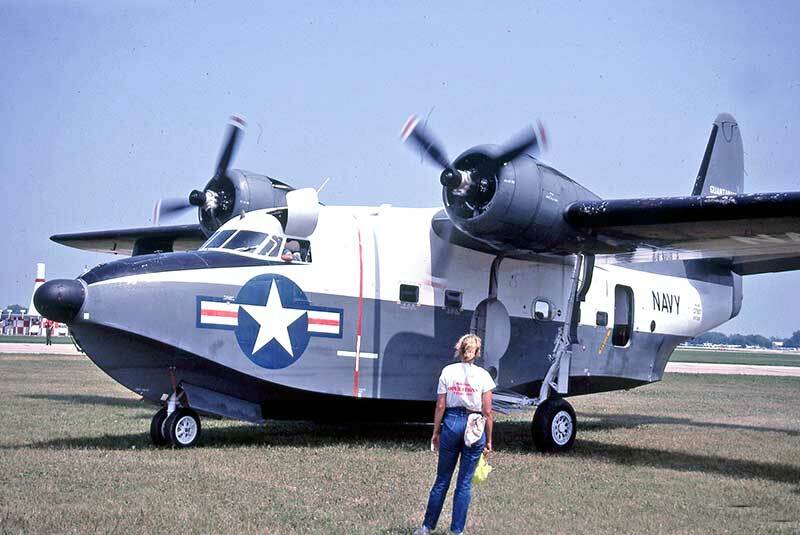 Dennis Buehn parks his HU-16C N9722B "Navy 137927 Guantanamo Bay" at Oshkosh July 1989 on arrival from Reno Nevada. 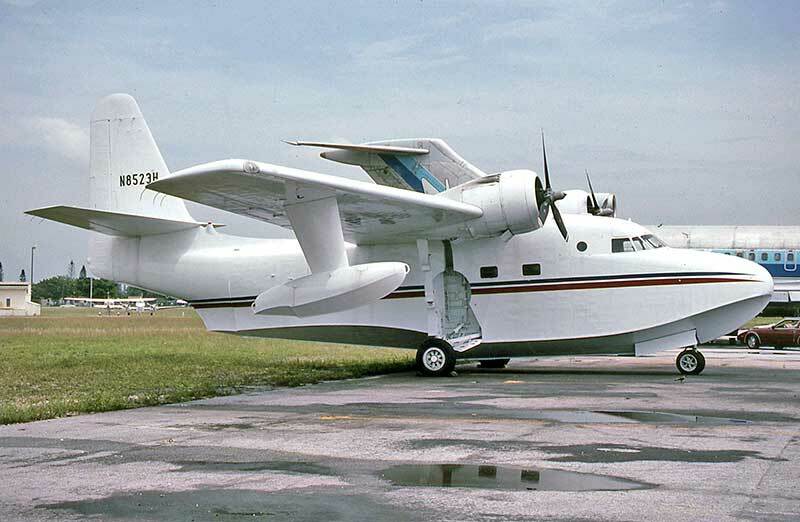 Wilson "Connie" Edwards arrives at Oshkosh July 1989 from Texas in his former US Coast Guard Grumman HU-16E.